Construction of the new bridge is nearly complete. Work will take place in late winter/early spring to install new street lights for the bridge and the George Mason Drive interchange. Final paving and marking of the roadway is anticipated to take place in April, when the air and ground temperatures are suitable. At that time, the permanent traffic pattern will be established and all cones and barrels will be removed. Landscaping and clean-up of the site is anticipated to occur by May. Construction began in November 2017 and is expected to be complete in spring 2019. Work hours (outside traffic work zones with no lane closures): Monday through Friday between 7 am and 5 pm. Work hours (inside traffic work zones with lane closures): Monday through Friday between 9 am and 4 pm; may be extended occasionally if unforeseen conditions arise. Occasional weekend and night work will occur. This project was combined with a sewer main upgrade project in this area. 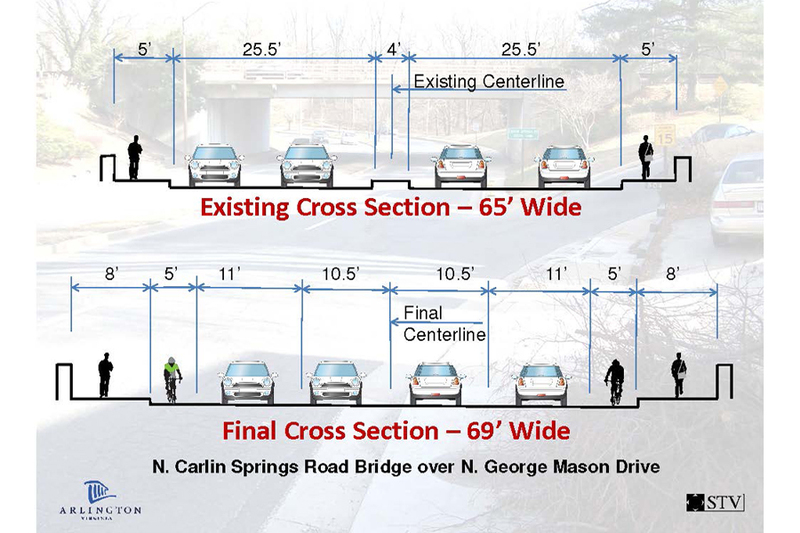 Combining these projects allowed for greater installation coordination and reduced impacts on area residents and drivers. 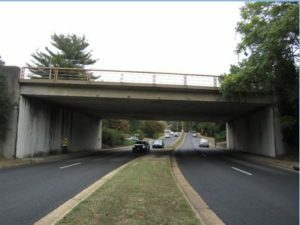 While still structurally sound, the Carlin Springs Road Bridge over North George Mason Drive has shown the greatest deterioration of any County-owned bridge. 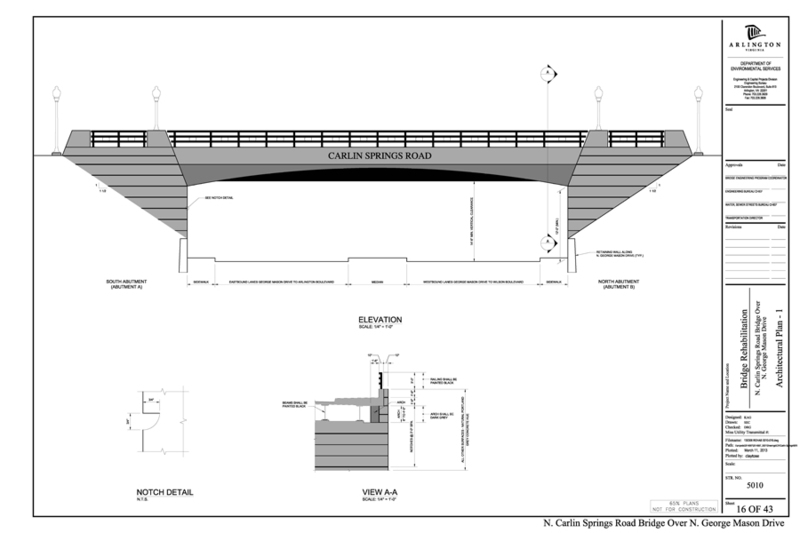 We will undertake a complete replacement of the existing bridge, with the rehabilitation project focusing on much-needed structural improvements and new safety features for drivers, pedestrians and bikers. 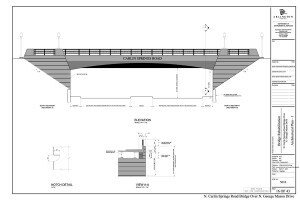 The new design includes a final cross-section that will be 69 feet wide, a slight increase from the existing bridge width of 65 feet. The County sought to include design recommendations that were collected from a public online survey. After a facade made of ashlar stone proved to be unfeasible, it was replaced with cast concrete. However, staff did incorporate many other community recommendations, particularly those pertaining to the arch, decorative railing and street lights and inclusion of the street name. 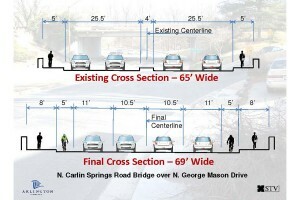 The project is funded by the County and the Virginia Department of Transportation.